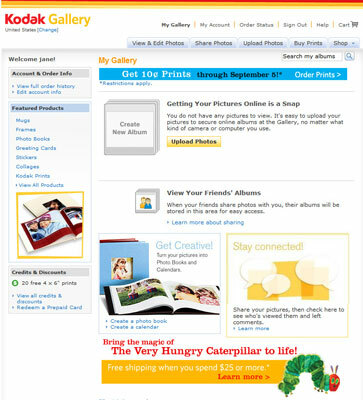 Part of an online community: If you’re a member of an online community, such as America Online, you get access to a photo-sharing site as part of your membership fee. Free sites with advertising: Some sharing services — Web sites known as online galleries — allow you to post your images for free in exchange for making you look at ads around the periphery of the Web page that displays your images. Free sites that try to sell to you: Some services sell software, which they offer you throughout their site, enticing you to buy their image editing and/or photo album application. Free sites with no strings attached: Some sites provide free space simply because they want to be nice or to perpetuate an interest in photography.